The Bio Rad Experion Automated Electrophoresis System provides a single platform solution for electrophoresis, power supply and imaging in a compact footprint. This gel electrophoresis system operates using microfluidic technology with special lab on chip assays, that uses tiny amounts of samples and returns results in as little as 30-40 minutes. Simply load the chip, and the system handles the rest, staining, destaining, band detection and imaging. The Experion uses pre packaged kits geared towards protein analysis, RNA analysis and DNA analysis, helping to streamline you upstream or down stream processes, quickly and precisely. The Bio Rad Experion Automated Electrophoresis System uses fluorescence detection for accurate quantify and size protein samples, evaluate the quality, integrity and concentration of RNA. This automated electrophoresis station also collects visual electropherogram data, ribosomal RNA ratios, and concentration data. 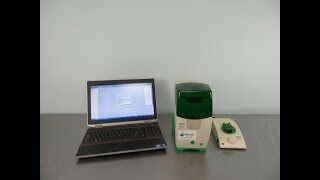 Data collected from this microfludics electrophoresis system can be analyzed and exported through the robust Experion software, data can also be stored for easy record keeping. This lab on chip analyzer software also lets users compare overlapping samples within a chip or chip to chip comparison, as well as a RQI function to help denote RNA quality. 5.8 x 8.1 x 3.1"
This Biorad Experion Electrophoresis Lab on Chip Analyzer has been fully inspected and is operating without issue. All of our lab equipment comes backed with our standard warranty. Should you have any questions, please don't hesitate to contact us.